In Acts 19:11-12, God used the medium of Paul’s handkerchief and aprons to heal the sick. In Exodus 14:16, God used the medium of Moses’ staff to split the Red Sea. In Acts 3:6, God used the voice of His servants, Peter and John to raise a crippled man. In 2 Kings 5:14, God used the medium of a dirty river to heal Namaan. In 1 Samuel 17:49, God used David’s catapult to defeat the giant Goliath. In John 9:6-7, Jesus used mud and saliva to heal a blind man. In Acts 5:15-16, God used the medium of Peter’s shadow to heal the sick. 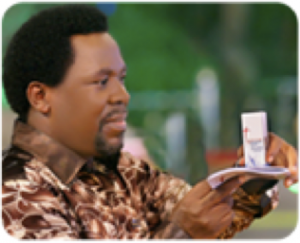 One of the mediums God is using in The SCOAN is the Morning Water. 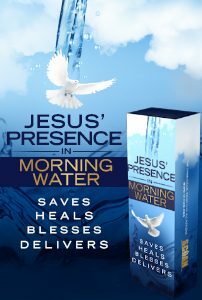 *Please note – the Morning Water is ONLY available in The Synagogue, Church Of All Nations (SCOAN) Headquarters in Lagos, Nigeria. It is NOT FOR SALE. Beware of any imposters claiming to be Prophet T.B. Joshua or represent The Synagogue, Church Of All Nations, demanding for money in the name of either of the above in the promise of providing Morning Water or other materials from the ministry. Healing, salvation and all of God’s blessings are free gifts of God. Jesus Christ paid for our perfect and complete healing when He died on the cross. Watch and pray, lest you fall into temptation (Matt 26:40).